This talk is about changes to the way we think about change. It’s about leaving people with more questions than answers. It is about leaving the people in the room slightly unsure as to whether I believe what I’m saying – and slightly concerned there may be a grain of truth in what I am saying. I was asked to do a speech on how to change people and working in organisational development and, having run HR and OD projects internationally for a large proportion of my career, that was a sensible request. I was also asked to speak because I like disagreeing with things. So here is the first thing that I disagree with – I disagree with the notion that I can stand on stage for 25 minutes and leave you with a few slides that explain how things work. I think I can give you 25 minutes of questions and reflections that might make you query whether my profession adds as much value as you think – and whether the reliance placed upon it is prudent. I want to take you on a rollercoaster ride where you end up in the same place that you started, but with an unsettling feeling in your stomach. I’m here to ask you if you are really sure that chunks of my profession aren’t peddling snake oil. If you are really sure that the experts have expertise. If you are really sure that you aren’t applying the handbrake at the very point you need to be accelerating. If you are really sure that we aren’t just getting this wrong each day. Berlin is a city that has seen more change than most and The British Embassy, where the conference takes place, only dates back to the year 2000. Upon conducting some basic research into the building I discovered it was designed by a chap called Michael Wilford. It could have been designed by anyone, anywhere,but it was designed by someone who – as luck would have it – was born 2 miles down the road from the small village where I grew up in East Sussex, in the heart of the 100 Acre Wood. You may notice that I grew up in a children’s cartoon. I’m hoping that makes you smile and even laugh as if it does you will relax a bit more into the presentation and find what I’m saying more plausible. We trust people more when we enjoy things with them. Hartfield is a leafy little village that was home to A.A.Milne who wrote the Winnie the Pooh stories or Winnie(-die-)Puuh as he is known in Germany. The stories in the books are centred around real life places. One of these is Pooh Bridge which I used to visit when I was younger. 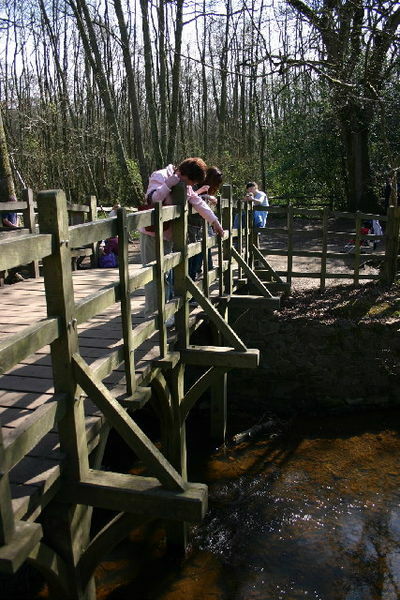 Pooh Bridge was the centre of a game in the stories called Pooh Sticks, a game with very simple rules. You all throw a stick into the river on one side of the bridge and the winner is the person whose stick appears first on the other side. Since 1984 a World PoohSticks Championship has taken place on the Thames. It’s a big deal, I’m not making this up. When I was younger Pooh Bridge was a ramshackle bridge, almost falling down. My brother and I used to play Pooh Sticks and the trick was basically to climb down into the water (or at the very least scrabble across the muddy banks) and look for where sticks got stuck, where the water flowed fastest and where the weeds were that could slow your stick down and cause you to lose. We had high visibility of the challenges so we had a reasonable way of predicting the result. In 1999 an appeal was made by East Sussex council to Disney (who own the rights to Winnie The Pooh) to help rebuild the bridge. As part of this process the old ramshackle bridge ended up looking like this. You’ll notice those nice safety barriers have been added which prevent you clambering down the banks. You’ll notice that essentially, the rules of the game have changed. The semblance of control we had over the result when we had when we were younger has gone. Our ability to understand and react to the environment has gone. We now just throw in a stick and hope – in fact the only thing we have control of is picking that stick for it’s weight, shape and length. We just hope it gets through the murk under the bridge successfully. The barriers that give control to the situation, that sanitise the experience, are the barriers that reduce our ability to adapt and learn. Yet still, whenever my brother and I play, we kid ourselves that we are somehow making decisions that lead to us winning. We pretend we make a difference because that is what people do. Year before my brother and I became so disproportionately upset about Pooh Bridge – upset that future generations of Poohstick players would never get to understand the flow of the river – upset enough to base a conference speech in Germany about it – the PreSocratic Philosopher Heraclitus.was writing about change and rivers. He nailed a couple of things that we appear to have forgotten in the last few thousand years in the rush to print management, leadership, change and OD books and to fit things on powerpoint slides for conferences that people can take back to the workplace and show as evidence the trip was worth it. Dubious statistics suggest that 70% of change management programmes fail. Finding evidence of the statistic is tricky, but finding people who think that statistics are entirely inaccurate is also tricky. Perhaps because Heraclitus (born in 535 BC) had nailed it first time round. Managing change never works because it is always different. The most common factor in change programmes is our ability to overestimate our ability to change people and influence the result. It is your belief that people like me ‘get this’ – and the reality may be that we are just people who believe we ‘get this’. We believe we change people. We probably don’t – we probably just influence in a hamfisted way and explain away poor results as unanticipatable. We believe we can use the same model we used last year to apply to a an environment that is changing beyond recognition. Changing in leaps and bounds not seen for hundreds of years. Global, social, connected, disconnected, immediate, unpredictable, rich and bankrupt. The first iPad was released on April 3, 2010. Now that looks like old technology. “We both step and do not step in the same rivers” said Heraclitus. It’s always a river, it’s always flowing, it changes so fast that we can’t define it. “McKinsey consultant Julien Phillips first published a change management model in 1982 in the journal Human Resource Management, though it took a decade for his change management peers to catch up with him “- this is according to Wikipedia (which is where we go for information now, but didn’t even exist until 2000). The first HR model illustrating how to get buy in to change took a decade to get buy in. And you trust us with your organisations, you bring us in to your organisations to provide advice. You ask us to help effect change in people and prospects. You ask us to work out how the org chart should look in two to three years to support a 5 year plan we know isn’t going to happen. We don’t change people. All we can do is create the environment where we can give people the opportunity to change. We can offer comfort and support, we can offer incentives, we can chastise and create worst case scenarios. We can’t change people. Nice work so far. I like this approach, and have successfully experimented with similar approaches. None Winnie The Pooh related (great choice btw), but crowdsourcing opinion, questions, content etc – yep – big fan. Twitter was fabulous in helping me build an interesting talk on wellbeing a while back. I look forward to reading more as this builds – and I hope you can infuse this piece of work with the excitement of uncertainty, in some way. That is part of what change is about I think, turning nerves into excitement.